I Am WATCHing You: The Seiko "TUNA"
SEIKO Prospex Marine Master 300m "TUNA"
When news of the Tuna being discontinued came about, I thought as a Seiko collector (especially since I am into their Divers line), I should own one. But the price tag of US$500 for a quartz, yes, QUARTZ, watch is really hard to justify to myself and to my wallet! In a spat of good timing, I received my annual bonus during end March. On 30-Mar, I ordered online from Seiya Japan and the EMS parcel arrived 1-Apr. When I opened the parcel, I was greeted by an awesome watch in full chunky steel! It is a massive diver at 46mm with lug width 22mm. I have a small wrist but the Tuna wears and sits perfectly balanced, another bonus point to the Seiko designers. It is interesting to note that the shroud design is inspired by the humble barnacle. The shape of the barnacle is able to withstand the harsh pounding of the sea waves. See the similarity? I am never a fan of Seiko's vented rubber straps so the first task was to change to an Oris-inspired rubber with deployant clasp. This thick black rubber gives the Tuna an elegant masculine appearance. 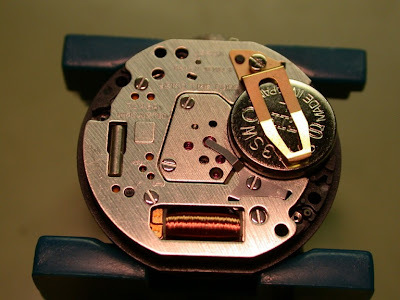 The caseback shows the year which the first battery change is due, Q1'2014, for my Tuna. This is a professional diver watch rated "He-Gas diving 300m". Note the sturdy constructed screw-down crown. Randall has a very well taken shot of the 7-jewel 7C46 caliber. Take a look at the full metal gear and rate trimmer that one can regulate the watch. Not for the faint-hearted nor the amateur, like me! Thanks Randall for sharing this rare photo! I will definitely wear this as my regular watch rotating with my other 7N42 Sports 200. The Tuna is a watch with subtle presence yet not screaming for attention. For those folks still hesitant, think no more as it is getting harder to find in brand new condition. Pre-owned ones are not cheap either. Get your Tuna before they swim away!